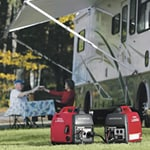 Packed with modern conveniences, small inverter generators are easy to carry, easy to set up, and easy to start. They come with features like digital gauges, remote start, eco-modes, and parallel kits. Fuel gauges have come a long way. While you can look up specs on a particular model to "guesstimate" how much fuel you have left, there are much more effective methods available on models these days. Some models have analog gauges, some have digital gauges, and then some have multiple gauges. Those with multiple gauges can even be capable of telling you how many hours of use you have left. They determine the time left by measuring current watts being used on one gauge and fuel consumption on another gauge, then using those readings to auto-calculate the amount of time to be displayed on yet another gauge. 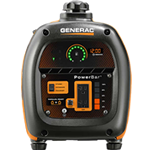 Paralleling two portable inverter generators offers you the ability to double your power while staying true to the clean, quiet power of a portable inverter generator. If you're worried that you may need to step up to a larger emergency-style generator to get the power you need, rest assured; you can simply invest in another inverter generator and connect them together for twice the power. Several new models of inverter generators are now available with electric start. This is a great feature to have when you're camping, because it allows you to provide power to all of your conveniences in the morning with the push of a button. However, it can also be a great safety feature. On some models, the remote start will shut down the generator if the oil level reaches an unsafe operating level. 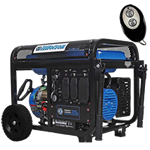 Some generators will allow you to start your generator from up to 300 feet away with a wireless remote. Another nice feature found on some of these small inverter generators is the eco mode function. Certain makes/models have this feature for reducing fuel consumption by reducing the RPMs as much as possible. They make this a mode that can be selected or deselected so that you can opt to turn off the eco mode if you wish to have more power for an appliance that requires higher starting watts. 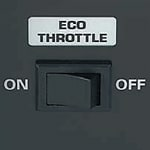 When you're not in need of the extra power, you can put it in eco mode and save fuel. In addition, because the RPMs are lower, the motor is quieter. Small Inverter Generator Buyer's Guide.. Our Power Equipment Direct how-to library can help you learn about How to Use a Generator for Tailgating, How to Get the Right Generator for Your Home and How to Save Electricity with Load Shedding.